At Blue Ribbon, we believe that when the power cuts out you deserve peace of mind. Instead of allowing storms or power line faults to disrupt your heat, telephone, refrigeration, and lights — leaving you with spoiled food, no means of communication, and bumping around in the dark — call Blue Ribbon for a standby generator. Blue Ribbon services, installs and maintains your whole-house generators. 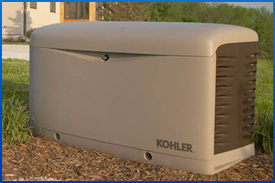 Our inventory of quality generators is made up of well known and respected manufacturers including KOHLER. Let Blue Ribbon help you choose the generator that's right for your electrical needs. Call us at (973) 667-7988 or fill out the form below for a no obligation estimate. If you already own a generator, let Blue Ribbon protect your investment! When the lights go out, you rely on your generator to keep your home up and running - rely on the Blue Ribbon team to make sure your generator is in tip-top condition. Our team of expertly trained technicians service most popular makes and models, including Kohler and Generac. We'll make sure your generator is reliable and efficient. Yearly Maintenance for Home Standby Generators Starting at $225! Got a generator? Give us a call today! For expert standby generator service and maintenance, look no further! To contact us, click here. in your home, please contact us below.